Over the years, the Center has worked to develop or help fund Southeast Asian-style performance productions and related educational outreach materials (particularly in the case of Wayang Listrik). This page includes overviews and supplemental materials for past and ongoing projects. Watch this space for the soon-to-be-released documentary film on the Wayang Listrik performance of Subali-Sugriwa: Battle of the Monkey Kings along with other gamelan/dance performance projects. This rendition of the Ramayana story ‘The Abduction of Sita‘, in Sendratari (Balinese dance-drama) style, tells the story of the kidnapping and subsequent rescue of Princess Sita, and featured classical dance and instrumental music from Bali. The production was a collaboration between the University of Hawaiʻi Balinese Gamelan Ensemble Gamelan Segara Madu, and the Tokyo-based Otomori Gamelan Studio with more than 30 performers from Bali, Japan, and Hawaiʻi taking part in the show. The production was the headline show for the 2018 Asia-Pacific Dance Festival (APDF). Under the direction of Dr. Kirstin Pauka, Department of Theatre & Dance, there have been two Wayang Listrik productions at the University of Hawaiʻi at Mānoa: The (Balinese) Tempest (2008), and Subali-Sugriwa: Battle of the Monkey Kings (2016). Additionally, a large component of the Wayang Listrik project has been educational outreach to local K-12 students, including the creation of a teacher’s resource guide and visits to neighbor island schools. The Center thanks the sponsors and community support that allowed the production and educational outreach to happen. 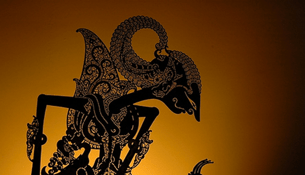 Upcoming in the 2019-2020 academic year will be a new Wayang Listrik production: The Last King of Bali. See our Wayang Listrik page for more information! Subali, Sugriwa, and the goddess. Production press photo via Kennedy Theatre. Musicians playing the gamelan instruments. Via Wayang Listrik blog. During the lead up to the production of Subali-Sugriwa, the Center with its partners in the UHM Asian Theatre Program developed educational outreach materials about Wayang Listrik as a genre, held workshops at local K-12 schools to engage the youth in this dramatic style, and performed a special show geared toward local K-12 students. The (Balinese) Tempest was the first Wayang Listrik production at the University of Hawaiʻi at Mānoa. The production was directed by Dr. Kirstin Pauka with guidance from Larry Reed, an acclaimed theatre artist who in the 1990s combined traditional Balinese shadow theatre with Western-style lighting, film, and dance. “Randai is a folk theater tradition of the Minangkabau ethnic group which incorporates music, singing, dance, drama and the martial art of silat” (source). From 2000-2012, Kennedy Theatre, under the direction of Dr. Kirstin Pauka, performed three productions in this style: Umbuik Mudo and the Magic Flute (2000), Luck and Loss: Manandin’s Gamble (2005), and The Genteel Sabai (2012). Manandin’s Gamble is a traditional coming-of-age story about love, gambling, and adventure. Master artists from West Sumatra, Mohamad Halim (internationally renowned master of traditional Minangkabau music) and Saparman Bin Jamaludin (master-teacher of Randai dance, acting, and silat (martial arts)) provided specialized training under the direction of Dr. Kirstin Pauka. Rarely performed outside of Indonesia, Umbuik Mudo is a tragic love story that unfolds amidst the wild jungles of Sumatra complete with magic flutes, robbers and dangerous quests. UHM students trained under guest artists in preparation for this production directed by Dr. Kirstin Pauka.